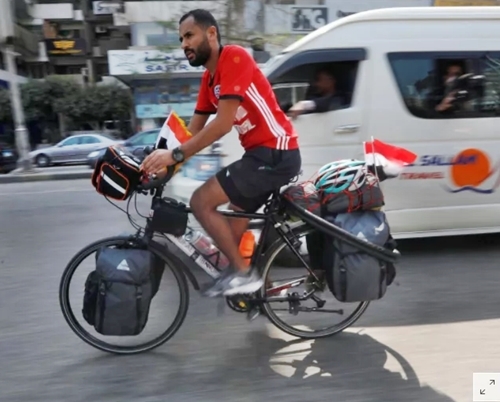 A 24-year-old Egyptian man is reportedly cycling from Egypt to Russia just to support his team during the next world cup which will take place in Russia this coming June. Mohammed Nufal embarked on the long-haul journey from Egypt and is planning to traverse seven countries across three continents including Jordan, Bulgaria, Romania, Moldova and Ukraine just to get to the world cup. Nufal said he will only take a flight from Jordan to Bulgaria to bypass a civil war which is currently happening in Syria. He expects the weather to be bearable during his kourney. According to his official Facebook page, Nufal said his trip would take 65 days covering a distance of some 5,000 kilometers (3,3160 miles). He expects to take nine days to travel 800 kilometers in Egypt alone, where his last stop will be in south Sinai’s Nuweiba, before heading to Jordan. Egypt qualified for this year’s World Cup for the first time since 1990.